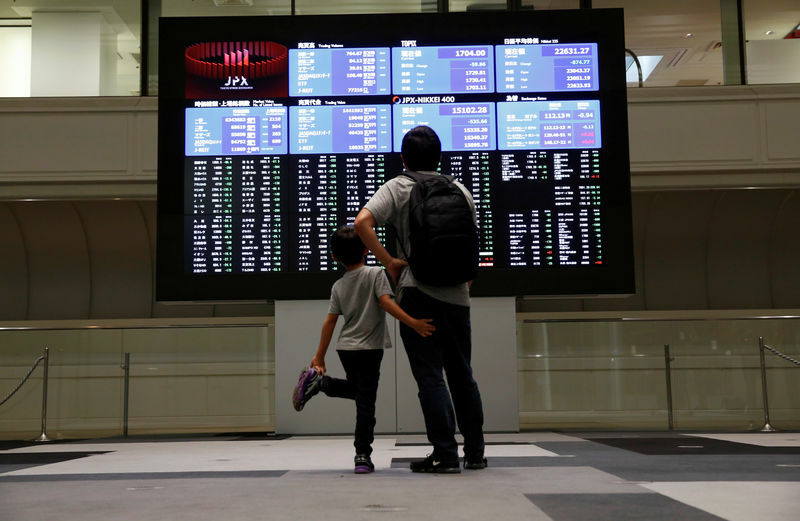 SYDNEY (Reuters) – Asian shares barely managed to hold firm on Monday after a tumultuous week for global equities, with U.S. stock futures turning down and Chinese markets deep in the red on fresh signs of cooling in the world’s second-biggest economy. MSCI’s broadest index of Asia-Pacific shares outside Japan was last up 0.3 percent after rising just over 0.5 percent earlier in the day. The losses in Asia were largely led by China’s blue-chip index which tumbled 2.5 percent following disappointing earnings from the country’s top liquor maker Kweichow Moutai. Chinese data over the weekend also underscored worries of a cooling economy as profit growth at its industrial firms slowed for the fifth consecutive month in September as sales of raw materials and manufactured goods ebbed. Citibank has projected China’s real economic growth to slow to 6.4 percent year-on-year in the fourth quarter “amid trade headwinds and domestic uncertainties,” compared to a 6.8 percent rise at the start of the year. “As lagging indicators, overall industrial revenue and profit should continue to soften accordingly,” it said. Wider sentiment in global financial markets has been hit by a range of negative factors from an intensifying China-U.S. trade conflict to worries about U.S. corporate earnings to Italian budget woes as well as Federal Reserve rate increases. Japan’s slipped 0.1 percent, having climbed 1 percent earlier while South Korea’s eased 0.4 percent. Shanghai’s SSE (LON:) Composite faltered 1.5 percent. E-Mini futures for the and minis declined about 0.1 percent each, after rising as much as 0.4 percent earlier in the day. Australian shares, up 1.2 percent, were a rare bright spot. Analysts warn of more volatility after heavy losses across major equity indices left investors with negative returns for the year. Bears are on the rise, with some indices already in official correction territory amid heightened worries over corporate earnings and global growth. “Sentiment is going to continue to dominate market direction in the short term,” said Nick Twidale of Rakuten Securities Australia in Sydney. “Earnings season continues…and political tensions in the United States, Italy, Germany and the UK will continue to add to volatility in their respective markets as well as contributing to overall global flows,” Twidale added. In another sign of risk aversion, 10-year U.S. Treasuries also reversed early gains to be almost flat on the day. The S&P 500 ended at its lowest level since early May on Friday and flirted with correction territory, pressured by heavy losses in technology and internet shares. Data out last week showed U.S. economic growth slowed to an annualized 3.5 percent in the third quarter with the slowdown partly driven by a tariff-related drop in soybean exports. Among emerging markets, Brazilian-linked stocks got a lift from the South American country’s presidential election, which saw the victory of far-right candidate Jair Bolsonaro whose campaign centred on promises to clean up politics and crack down on crime. Tokyo-listed Brazilian stock exchange traded funds (ETFs) jumped nearly 14 percent to 7-1/2-month highs after Bolsonaro, a former Army captain, propelled to victory. The safe-haven Japanese yen has benefited from the global sell-off in riskier assets as investors unwound carry trade exposures. It gained 0.6 percent last week and was last at 111.87 per dollar. Over this week, investors will be keeping an eye on the Bank of Japan’s monetary policy announcement due Wednesday. The rose 0.1 percent to 96.470 after gaining 0.7 percent last week. The euro hovered near a more than two-month low to hold at $1.1390. Investors heaved a sigh of relief after German Chancellor Angela Merkel’s junior coalition partners gave her conservatives until next year to deliver more policy results. However, concerns loomed over her future after both parties suffered in a regional election on Sunday. Sterling held near a two-month trough of $1.2775 ahead of Britain’s annual budget due Monday. Finance Minister Philip Hammond will likely urge his divided Conservative Party to get behind the government’s push for a Brexit deal, or put at risk a long-awaited easing of austerity. In commodities, oil pared early gains as well tracking Wall Street futures. was up 5 cents at $67.64 per barrel and slipped 4 cents at $77.58. was barely changed at 1,233.46 an ounce.